Custom Arthur Rutenberg home located in the lovely Breckenridge Heights community of Heathrow. This home features a large paver patio area with an open pool & spa, completely private and beautifully landscaped! Your own back yard oasis! Adjacent to the pool is a 600 ft. addition to the home with sliders that open to the lanai. This flex space is perfect for entertaining poolside. Or it can be used as an office or a private additional living area accessible through the Master Bedroom. The interior of the home has lots of natural light and views of the beautiful pool area. The home features a formal living and dining room, and an updated kitchen with granite counters and stainless appliances that is open to the Family Room. The Family Room has large sliders that open to the lanai and a wood burning fireplace. The home is a 3 way split plan with the 4th bedroom being perfect for a playroom, office, or guest suite with use of the pool bath which has recently been remodeled. The Master Bedroom is spacious and adjoins the Bonus/Flex Space. The Master Bath has been tastefully remodeled and includes a walk-in shower, soaking tub, and his and her vanities. The current owners have just replaced the carpet in the secondary bedrooms and office. The pool heater was replaced in 2011, the AC in 2017, the pool has landscape and new LED lighting. The oversized 726 SF garage floor has recently been recoated. The Breckenridge community is located near the golf course and has easy access. One of the newest homes in Heathrow's Coventry Community. This tastefully designed home has over 3100 square feet of living mostly on the first level with a second floor bonus room and bathroom. Potential buyers will appreciate the privacy that this home is afforded, it is located on the quiet end of the street with tons of privacy landscaping. The back lanai is screened in and there are beautiful mature trees behind the home. Upon entering the home there is a office/den to the left that can be closed off with double French doors. There is a formal dining that features tray ceilings with easy access to the kitchen. There is a large great room at the back of the home that is open to the kitchen. The large kitchen features a large center island with granite counter tops, dark espresso 42 upper cabinets with built in refrigerator, stainless steel gas stove, dishwasher, microwave and oven. There is a large eat in nook in addition to the breakfast bar for casual bites. Coventry is a natural gas community. The split bedroom floor plan allows everyone privacy with the master at the rear right of the home and the 3 secondary bedrooms along the left side of the home. The 2nd and 3rd bedroom share a Jack and Jill bath and the 4th bedroom has access to the back bathroom. The back bathroom has access to the outdoor lanai. 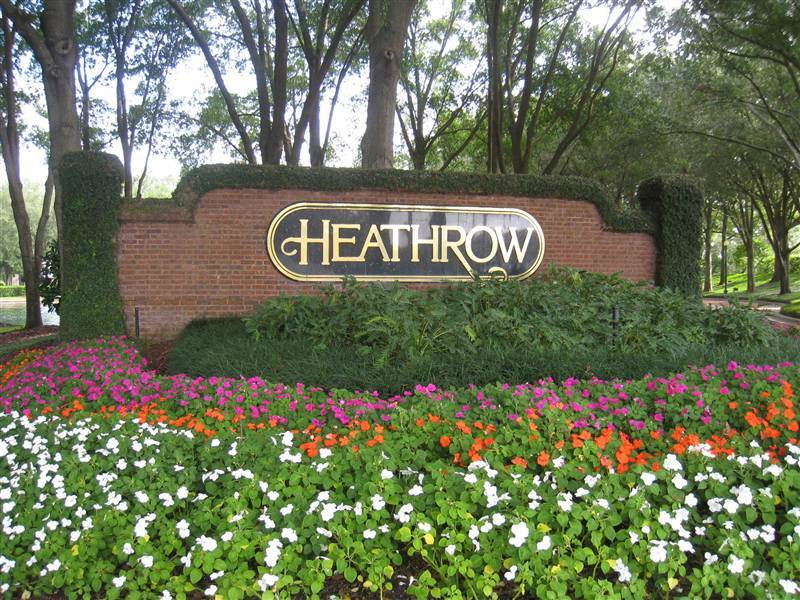 Enjoy all of Heathrow 8217;s amenities including two playgrounds , basketball courts, soccer fields, pavilion, a club house and much more. Seminole County enjoys A rated schools! Custom Designed Home by the Original Architect/Owner on a Private Acre Lot with views of Lake Marietta from the front of the home. Open floorpan with 4 bedrooms, 3 1/2 Baths and a Huge Completed Basement/Bonus Room. Home opens to a large covered and screened lanai for entertaining and fun family times! Split plan with Master on one side of the home and then on the opposite side 3 more bedrooms. As you enter the home, you walk into an open living room space with brick wood burning fireplace which is double sided to the family room. Kitchen opens to the family room. Basement has a half bath and access to the Nursery which has a Lexan Roof. Basement walls are 12 block filled with concrete. You can access the bonus/basement from the main floor or from the outside of the home as it has it's own private entrance. Private one acre lot. Lanai is fully screened and you can close off the upper portion of it by inserting the panel doors providing air conditioning for entertaining or an outside area to play. Large Windows with 3M film for wind protection. Refrigerator 2013, Range 2017. New Lanai Screen 2018, Sundeck topping 2018. AC 2016. Central Vacuum, New Roof 2018. A Door then Stairs lead to the attic which is entirely floored for amazing storage above the entire home. Oversized garage with insulated door allowing it to be air conditioned when you'd like. Also has it's own bathroom. This home may be under video and/or audio surveillance. Location, Location, Location! This property is a must see located in the UPSCALE Twelve Oaks, GATED community, in the heart of Lake Mary. Easy access to the 417, I-4, shopping, restaurants, Lake Mary schools, walking/biking trails and the new $200 million dollar Griffin Farms at Midtown. This 2017 Strata 4/3.5 is built with the LATEST IN ENERGY EFFICIENT TECHNOLOGY, maximum indoor air quality, and includes a transferable A/C warranty! Completely OPEN FLOOR PLAN with 2769 sqft impresses starting at the street. Enter the front door and feel the WOW of the latest in design and finishes that will make you want to explore the surprises found in this upscale and very impressive home. This beautiful 3 WAY SPLIT LAYOUT with ENTERTAINERS KITCHEN AND LARGE ISLAND ensures maximum use of every square foot resulting in not only jaw dropping casual elegance, but a home that functions exceptionally well. The setting is beautiful with over 1/4 ACRE LOT w/FENCED backyard with enough room to put in a pool of your liking right in the heart of Lake Mary! This craftsman inspired floor plan built by the multi-award winning David Weekley Homes enjoys clever attention to lines of sight, fabulous craftsmanship with an innovative open, light and bright floor plan! Enjoy the latest in energy efficiency in the wonderful like new home. Welcome home to 12 Oaks at Lake Mary! If you are looking for a 6 bedroom home at an affordable price, your search is over! This home which backs to the Wekiva River Preserve features the Master and 4 secondary bedrooms downstairs (one is being used as an office and adjoins the Master Bedroom.) Upstairs is an additional bonus room, bedroom and a full bath. There is tile in the wet areas, and high qualify laminate throughout the rest of the home. The stairs are oak treads. The kitchen has upgraded 42 cabinets, and new stainless steel appliances. Other upgrades include Leaded glass front entry doors, DR has chair rail molding w/ 6 baseboards throughout, crown molding in the main living areas and Master Bedroom. Surround sound in FR, wired for surround in bonus room. Upgraded A/C units-3 ton and a 3/12 ton which is new. There is a large covered lanai area and a heated screened pool overlooking the beautiful conservation area. The 3 car garage is oversized and has shelves above garage door, laundry tub, phone jack, walls & floorpainted-a workshop dream! This home is on a low traffic culdesac street. Excellent value and a must see! Under Construction. The Lariat blends timeless luxury with top-quality craftsmanship to create a remarkable family home. Vibrant space and limitless potential make the open concept floor plan a decorator 8217;s dream. The streamlined kitchen boasting Timberlake Lausanne Cherry Slate full overlay cabinets and Viatera Minute countertops is designed for the resident chef and includes plenty of room for storage, prep, and presentation. Retire to the elegance of your deluxe first floor master bedroom, featuring a luxurious bathroom and a wardrobe-expanding walk in closet. Each lovely spare bedroom offers a walk in closet and incredible personalization potential. The upstairs retreat provides a lively place for a family theater or a fun and games lounge. Lifestyle refinements include bonus garage storage, a downstairs powder room, and decorative staircase shelving. Get the most out of each day in this 2 story, 3 bedroom, 2.5 bathroom Energy Saver 8482; new home. FANTASTIC GOLF COURSE VIEW! This 3 bedroom 3.5 bath home has something for everyone. 13; Interior features include custom kitchen cabinets, granite counter tops, breakfast bar, hard wood flooring, newer A/C units, gas burning fireplaces, surround sound French doors, and a butler's pantry. Exterior features include, a newer tile roof installed less than 10 years ago, paver brick driveway, 3 car side entry garage, a whole house generator, a screened porch, and a large pool deck with breathtaking views of golf course and lake. HOME MAY BE UNDER AUDIO AND VISUAL SURVEILLANCE. Amazing deal on this newly built BRAND NEW 4 Bedroom 2 Bath &1 Half Bath, 2 car garage home with 3011 SQFT.This gorgeous water view home is located in the very intimate Lake Emma Sound, a gated community in Lake Mary. This Cyprus Model is an open 2 story plan featuring the Master Bedroom down with an amazing Gourmet Kitchen a 5 burner natural gas cooktop, Kitchen Aid appliances, Granite Countertops in the kitchen. 42 Light cabinets, Undercabinet lighting, Pendant lighting make the openness of the downstairs light and bright. An eat-in area with sliders to the brick-paver patio that lines the exterior back of this home. A Built-in desk with a stone top in the office area off of the family area is the perfect space to set up your home office. The front room has gorgeous water views can be utilized as either a formal Living/Den or Dining Room. Additional features the owner has added is the Wood Spindle ebony railing, Deco Glass Front Door, garage door opener, Electric Lighting package (extra cans), Electric lighting pkg w/keyless entry for garage dedicated GFI in garage extra lighting. This well built Pulte Home is ready with gutters, a brick-paver driveway, St Augustine Grass and a sprinkler system and more. The owner had it built to move into. No waiting for a home to be built this is a move in ready home. Location is Half a mile to I-4 and a quarter mile to Lake Mary BLVD. Top-ranked Seminole County Schools with quick access to shopping, dining, and entertainment.